Last week I had a long conversation with a friend who recently got “kicked out” of his church because of sin in his life. It always surprises me when a church, the place where sinners are supposed to find help, kicks those sinners out of church for the sins they most need help with! What is wrong with us? How do we think this is anything like Christ? I laughed at his assertion that it was a great church. Great churches don’t give up on sinners. Great churches work with those that have issues and try to restore them in good faith. Great churches don’t kick sinners to the curb. I guess I could understand if he was not repentant and not willing to seek help. He insisted that he was willing to do all of these things. I asked if he had talked to his Pastor. He said that he had and that the pastor just said that he was sorry but that it would be best to stop coming to the services. I asked my friend if the pastor offered to counsel him or anything. My friend simply said no and that the pastor and the members of the church made it very clear he was not welcome. Now to be fair… I only have one side of the story and I did not ask nor did I seek to know any of the details of his sin. But I will say that this wasn’t the first time I have heard of such an incident. Something is wrong in the Church today. I don’t say that lightly, or as someone who thrives on criticizing everyone else so as to establish my own spiritual superiority, or as someone who is feeding on sour grapes because things aren’t the way I would like them. I say it because of how many people I meet on a daily basis who are discouraged by traditional church and have chosen not to attend anymore. Seems as of late, everywhere I turn, I hear people complaining about the same thing. This isn’t something localized to a particular area or limited to a certain denomination. I hear this from all sorts of people, many with years of commitment to the church. People who are believer’s and those that are lost, they seem to refuse to attend church, not because they don’t believe, but because they are repelled by what they see. Those who do attend church often say that their personal church is great, yet condemn other churches saying something is wrong. 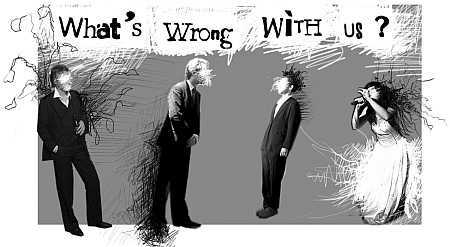 No matter how you view this issue, no matter what position you have, no matter what church you belong to, you have to admit that something is wrong in many of our churches. I am not saying all churches are this way but it is disturbing at the number that are. We are supposed to be the salt of the Earth, as something that gives flavor to make a meal taste good. But when we are not attracting the lost, but rather repelling them, then our salt has lost its savor. What makes it even worse is that we are even repelling the saved. Not to mention that we are kicking out people because they have sinned. Now before anyone thinks that I do not believe in church discipline, let me give some clarity. I do indeed believe in church discipline. As a person who has personally experienced church discipline firsthand, I know all about it. The truth is that in my personal experience most of the actions that took place were something different from what church discipline really was supposed to be for and at best it was a far cry from what God intended it to be. In many examples, the church members set themselves up as the judge and jury of those that have fallen in their walk with Christ. It doesn’t take long for the rumor mill to circulate the sordid details of someone’s fall from grace. Usually the time between Sunday School and the main service is long enough for the lines to have already been drawn and someone’s fate and future in that church to be determined. Again… I believe in church discipline. I believe that it is to be done properly. The goal of church discipline is not to throw people out of the church or to feed the self-righteous pride of those who administer the discipline. It is not to embarrass people or to exercise authority and power in some unbiblical manner. The purpose is to restore a sinning believer to holiness and bring him back into a pure relationship within the church. I believe the church is to do everything they can to restore that person back to Christ. If that person refuses, then yes… I believe that the church has an obligation to break fellowship with that believer until they come back to repentance. The finer details of church discipline are for another post and another time. Did my friend sin? Oh yeah, he did. But it wasn’t the unpardonable sin and it surely could have been dealt with and put away. My friend tells me he was willing to do whatever he needed to do to be reconciled back to fellowship. How would Jesus have dealt with the same thing? He forgave! He forgave the woman caught in sin, He forgave the leper for breaking the law by reaching out and touching Him, He forgave Judas… and He forgave me! Hey church… there are people among us, people who sin. People who are trying to deal with their sin, repent of it and walk with Christ. But we seem to have trouble with sinners, we expect everyone to have this whole Christian thing figured out, but no one does. 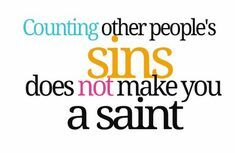 Counting other people’s sins does not make you a saint. We are ALL messed up, we all SIN, we are all working on becoming more like Christ and no one gets it right… no one. NOT EVEN YOU!!! I’m forgiven, but I still mess up. I still sin. I don’t want to, it is not my intention to sin yet I still do (Romans 7). I’m forgiven, but I’m not perfect. I will be perfect one day, but for today, I’m a work in progress… a believer, forgiven, but still dealing with the sin that I do. One day, when Christ returns, I will be like Him, but until then give me grace, give me space. As a believer, I know that we all struggle, we are all fighting the man we used to be in order to become like Christ (Heb. 10:14). So what is wrong with the church? Why does the church allow the dismissal of a believer without proper church discipline? Please understand, most churches are run by the elders. Basically, they tell the Pastor what he or she can or cannot do. These are fallible people. If one or two have stronger opinions about something, like a specific sin, or a specific person, they can basically put pressure on the Pastor. He can ignore them, or not, they can fire him or not! Couldn’t agree more. I wrote a short story about this very thing called M.A.S.K.D.. The failure of church people to accept universal sinfulness is a great modern tragedy. Paul would have a field day with an epistle to American churches.